Go to any of the first grade classrooms at Tukes Valley Primary, and you’ll find a “calming corner” set up to help students get in control of their emotions. Each calming corner has a basket with a coloring book, a stuffed animal, a visual timer, and a copy of “Sometimes I’m Bombaloo,” a book about a young student who learns to get in control of her negative emotions. 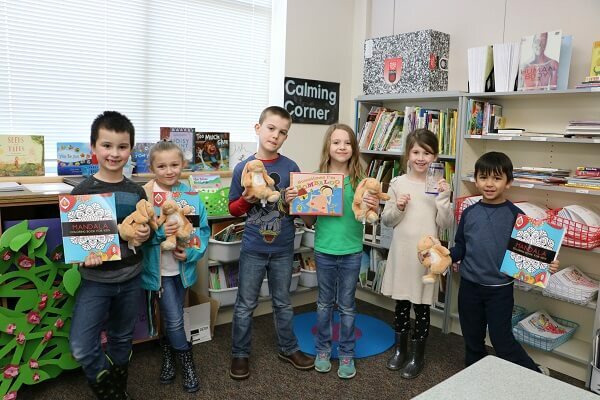 The first graders at Tukes have been tackling some pretty big life lessons this school year, discussing ways to help students who struggle with managing their emotions and become disruptive to the learning environment. Perhaps most impressively, the kids took ownership of the calming corner project and put in the effort to make it work, and now their grade has seen a drop in defiant behaviors among first graders. It all started when health and physical education teacher Ann Croze discovered a trend as she pored over Tukes Valley’s student behavior data. The majority of classroom referrals among the school’s first graders were due to defiant behavior when attempting to avoid doing a given task. Croze set out to help address this trend and recruited the help of Battle Ground Public Schools’ Positive Behavioral Interventions and Supports coach, Kristen McIntyre. McIntyre visited all six of Tukes Valley’s first grade classes and presented to students some ideas about why they might sometimes “flip their lids,” or get upset and act out. One of the Battle Ground Public School district’s strategic goals is to support the social and emotional well-being of students. By teaching students to identify their emotions and understand their feelings, they can learn how to manage those emotions and express themselves in healthy ways. Battle Ground Public Schools has counselors at all of its schools and uses teaching tools and a system of Positive Behavioral Interventions and Supports to teach social emotional skills and behavioral expectations to students. At Tukes Valley Primary, McIntyre delivered several key messages to the first graders. She shared that emotional outbursts don’t just affect the student experiencing them, but also the teacher, other students in the classroom, and the ability for learning to happen as well. McIntyre explained that there are often underlying reasons for behavior issues, and that just because someone may be acting out and being disruptive, that doesn’t make someone a bad person. McIntyre and Croze stressed to the students that they can be helpful as peers and remind each other about strategies to calm their emotions. Together, the first graders, teachers and McIntyre looked over the student handbook and discussed how and why rules are created to provide the students with a basis of understanding for how to navigate the world. Now that the first graders had a better understanding of the issues and how they could help, the next step was to begin exploring possible solutions. That’s when the idea for stocking the calming corners with baskets of helpful items was hatched. The students selected four things for the baskets that would be the most helpful in calming down, and also discussed how they could acquire those items for each classroom. The first graders decided they would perform a chore or job at home to earn a dollar to contribute toward the project. The Tukes Valley PTO helped distribute a letter and envelope to first grade families, and the first graders were given a week to complete their chore and collect their dollar. First grader Landon Pulse said he helped do cleaning chores around the house, and Aubrey Culver spent time babysitting her baby cousin to earn their contributions. At the end of the week, the students had raised about 75 percent of the funds needed to purchase the calming items. At first, Croze and the students talked about cutting back on some of the items to stay within their budget, but ultimately, they submitted an application for funding assistance to the PTO, which covered the remaining $37. In a comparison of the behavior data six weeks before and six weeks after first grade classes created the Calming Corners, the number of first grade referrals for defiance decreased 30 percent. While there are many factors for this drop, Tukes Valley credits the lessons learned from this project as a key part.